TRACER is a suite of 700 algorithms, whose features can be combined to create the optimal formula for detecting those words, sentences and ideas that have been reused across texts. Created by Marco Büchler, TRACER is designed to facilitate research in text reuse detection and many have made use of it to identify plagiarism in a text, as well as verbatim and near verbatim quotations, paraphrase and even allusions. The thousands of feature combinations that TRACER supports allow to investigate not only contemporary texts, but also complex historical texts where reuse is harder to spot. TRACER is language-independent and has been successfully tested on: Ancient Greek, Arabic, Coptic, English, German, Hebrew, Latin and Tibetan. Miyagawa, S., Büchler, M. (2016) ‘Computational Analysis of Text Reuse in Shenoute and Besa‘, 11th International Congress of Coptic Studies. July, 28. Kokkinakis, D., Malm, M. (2016) ‘Detecting Reuse of Biblical Quotes in Swedish 19th Century Fiction using Sequence Alignment‘, Corpus-based Research in the Humanities workshop (CRH). December, 10. Warsaw, Poland. Franzini, G. (2016) ‘English translations of Pan Tadeusz: a comparison with TRACER‘, Corpus-based Research in the Humanities workshop. January, 19. Online. Büchler, M., Burns, P. R., Müller, M., Franzini, E., Franzini, G. (2014) ‘Towards a Historical Text Re-use Detection‘, In: Biemann, C. and Mehler, A. (eds.) Text Mining, Theory and Applications of Natural Language Processing. Springer International Publishing Switzerland. Büchler, M. (2013) Informationstechnische Aspekte des Historical Text Re-use (English: Computational Aspects of Historical Text Re-use). PhD Thesis. Leipzig. TRACER was nominated for the DH Awards 2016 in the ‘Best DH Tool or Suite of Tools’ category. 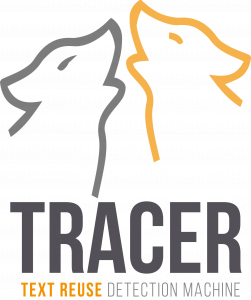 If you use TRACER (and the user manual), we’d be delighted to hear about your experience. Your comments are essential to improvement! A (free) copy of TRACER can be requested and downloaded. With it, you should also download the USER MANUAL, which provides information on how to set-up and run TRACER. The manual is a work in progress. For more detailed information about TRACER or for assistance, please consider attending our yearly workshops held in various locations across Europe. These are announced weeks in advance, so please check our News page for updates. TRACER development: for those interested in contributing to the technical development of TRACER.